Just a quick update for now. This past week, from the 3rd to the 9th of March, a lot of artists have contributed their Ghibli-related artwork to The Ghibli Jam tumblr. I decided to join in, partly because I couldn’t find much love for one of my favorite movies of all time – My Neighbors the Yamadas. So I drew the whole family! Well, almost… I realize now that I forgot the dog! Here’s a link to the Tumblr post. If you haven’t watched the movie, here’s a semi-long review I wrote some time ago, just in case if you’re interested in my thoughts about it (no spoilers). 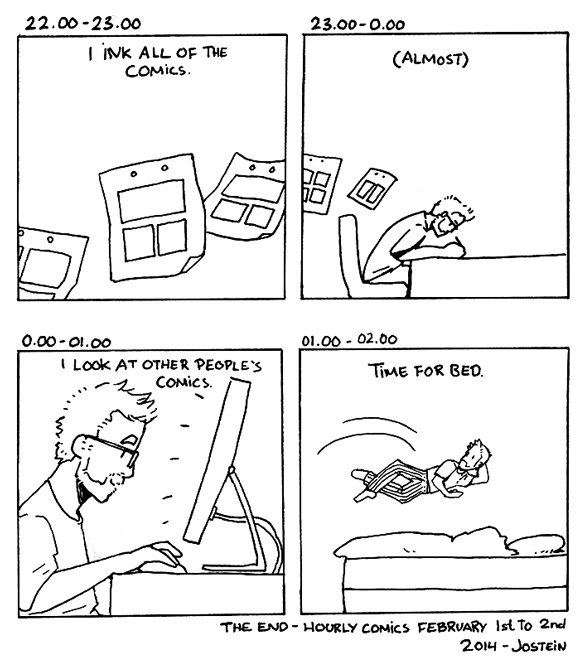 Yesterday, February 1st , was Hourly Comic Day. 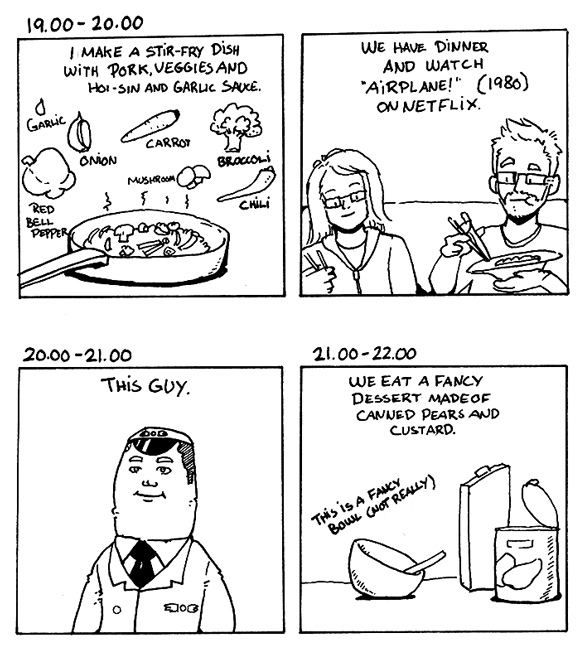 Here are the comics I drew. 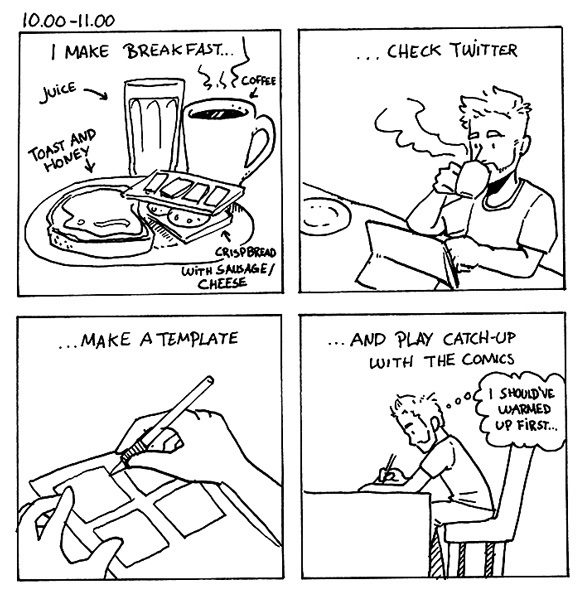 If you’re interested, you could also check out the comics I did for Hourly Comic Day 2013. That’s it! Thank you reading! Not too exciting, but it was fun (and exhausting) to draw. 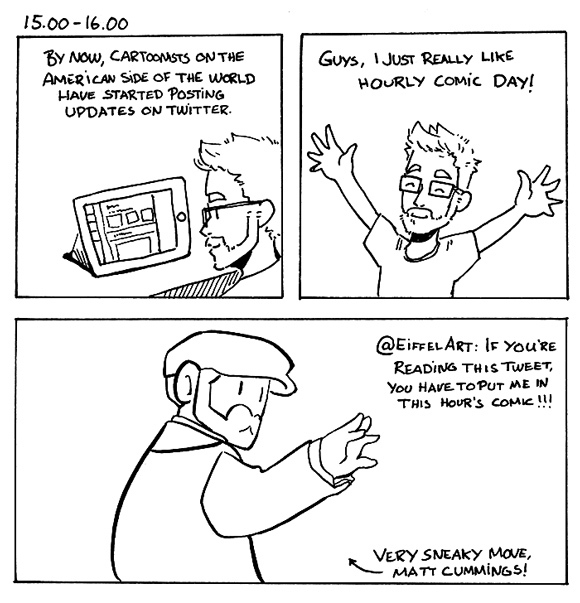 Shoutout to Matt Cummings (@EiffelArt), who got included in the comic through that sneaky tweet. 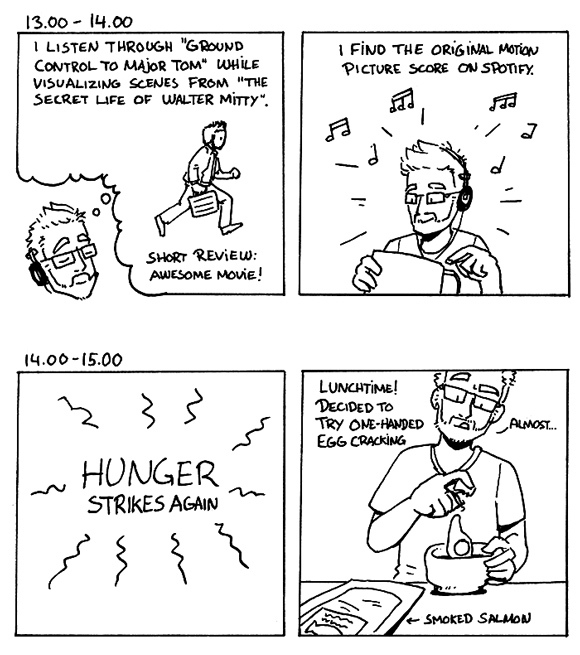 Update: Here are some of my favorites from Hourly Comic Day 2014. I definitely recommend checking them out! I had the pleasure of being the first featured artist in a series called “The Uprising”. It includes an interview where I talk about my influences and my favorite artists. Please check it out if you’re interested! I’ve been working on a few character designs based on “Ciphers”, which is a sci-fi novel by Mary, the author of the very same blog I mentioned. Now, I could say that Mary is an aspiring writer, but that would be wrong, as she’s clearly way beyond the “aspiring” stage. 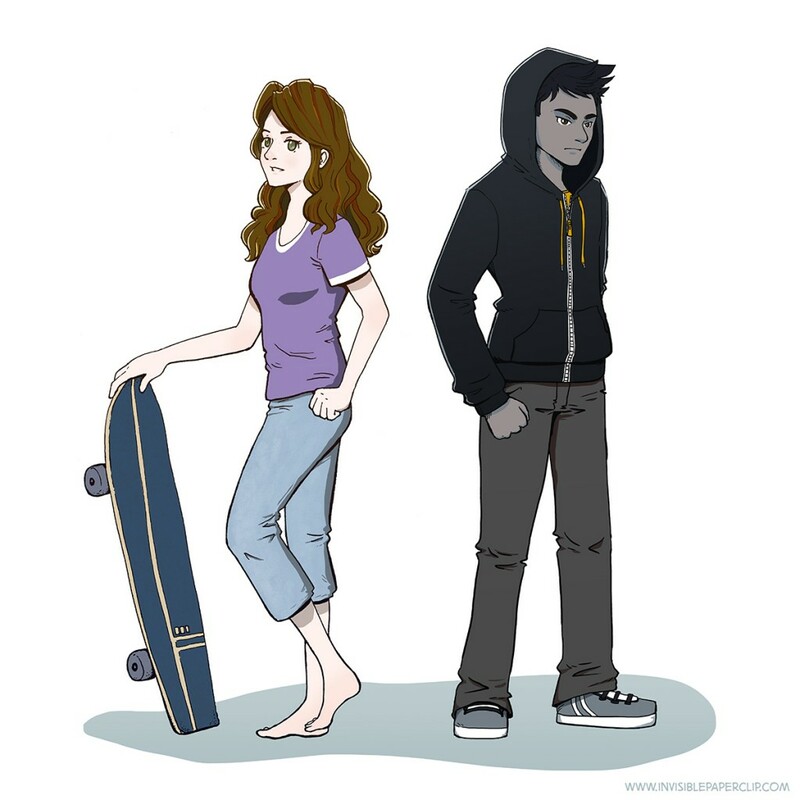 “Ciphers” is a novel aimed at an audience in the 18-30 age bracket (New Adult), and the story revolves around Brid and Siph, a tomboyish linguist and half-alien guy with a considerable temper, respectively. Mary is not only a proficient writer, she’s also worked as an English teaching assistant in Naju, South Korea, and is currently working and living in Osaka, Japan. There are several honest and vivid anecdotes from her experiences as an American abroad on her blog. She also blogs about everyday life, writing and her passion for language. 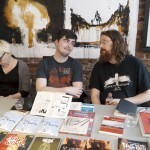 The second day of the Raptus International Comics Festival is over. It has been a gray and rainy day in Bergen. In contrast, the Raptus venue has been bubbling with brightly colored costumes, creative energy, and happy comic fans all day. For me, it has been a great day as I’ve attended a handful of inspirational and informative talks and met skilled artists. First talk of the day was on the topic of webcomics, and the guest of honor was Emily Carroll (on the left in the photo above), known for her horror comics. One of the many interesting things she talked about was how she had utilized the “infinite canvas” (scrolling through the comic, instead of clicking a button to get to the next page). 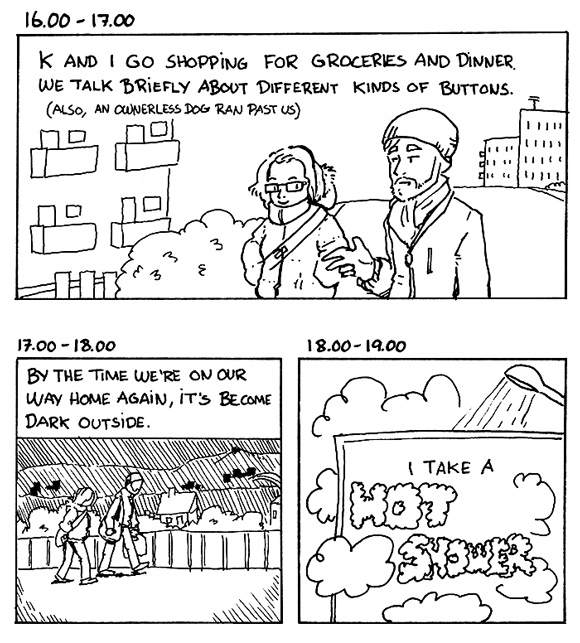 All without being aware of the concept as described by comics guru Scott McCloud. 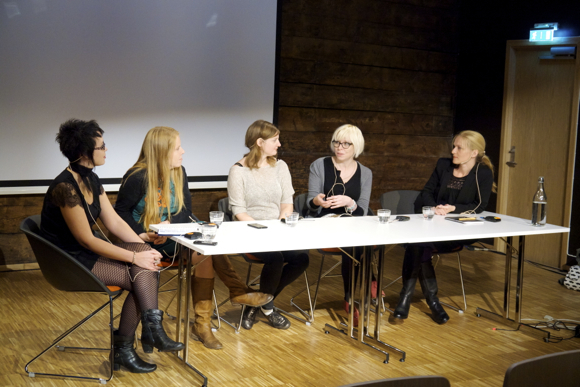 The second event I went to was a discussion panel with four female cartoonists. From the second person to the right (going left), Lene Ask (Norway), Sara Oleksyk (USA), Terhi Ekebom (Finland) and Nina Bunjevac (Yugoslavia/Canada). This was also a truly honest and inspirational panel, and the panelists worked great together. Comic artist and illustrator Steffen Kverneland recently published an extremely detailed and thorough graphic biography of the Norwegian painter Edvard Munch. During his presentation, he made jokes about how his process on the biography included reading huge stacks of books as research, and even bringing them with him on his honeymoon. He also included a few “embarrassing” photographs that he or his wife had to shoot for drawing reference. A few of the tables in the sales area. 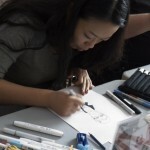 Manga artist Yishan Li from the UK drawing someone’s portrait in manga style. Comic artists in a row. From the left, Terhi Ekebom, Eirik A. Vik and Kim Holm. 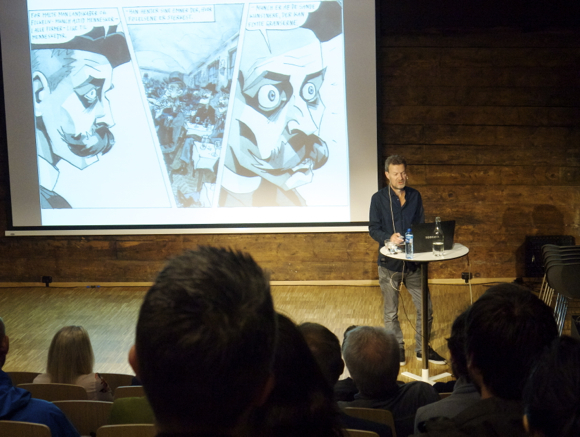 Ida Neverdahl and Øystein Runde talks about their collaboration travelogue about their trip to the KomMissia comic festival in Moscow. 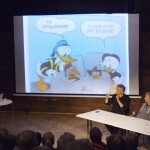 Photo from a panel with Donald Duck artist Arild Midthun, together with editor Tormod Løkling and script writer (and TV personality) Knut Nærum. 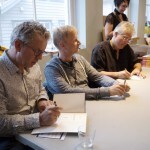 Knut Nærum, Tormod Løkling and Arild Midthun drawing and signing books after their panel. 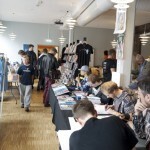 As you may have noticed from the photos above, I had the chance to meet the “Donald Duck trio” consisting of artist Arild Midthun, editor/writer Tormod Løkling, and script writer and TV personality Knut Nærum. I was bold enough to ask for their autographs in my little black Moleskine notebook, and they were happy to comply. I also bought a signed copy of the fourth Hall of Fame collection of Midthun’s Donald Duck comics. All in all, it has been a great day. I’ve got even more comics to read, which is awesome, and I feel inspired by all the talk about writing, creating and publishing comics. It doesn’t hurt to be around a lot of comic artists and comic fans once in a while, which is why I’m thankful that Raptus makes this happen. Year after year. 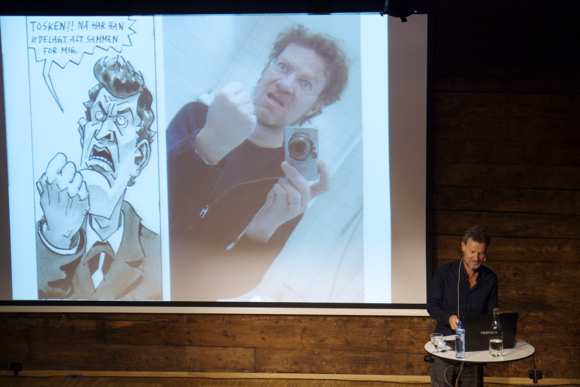 This is a short write-up of my personal experiences from Raptus International Comics Festival 2013. Today was the first day of the festival for me. I missed the official opening, but I got there in time to attend a few late afternoon talks. And, of course, to peruse comics and spend some money. I went to listen to an interview with Sarah Oleksyk (website/tumblr), who is a storyboard artist working on Regular Show. She talked about how she at an early age wanted to be a cartoonist, and how she developed her style through making autobiographical comics. 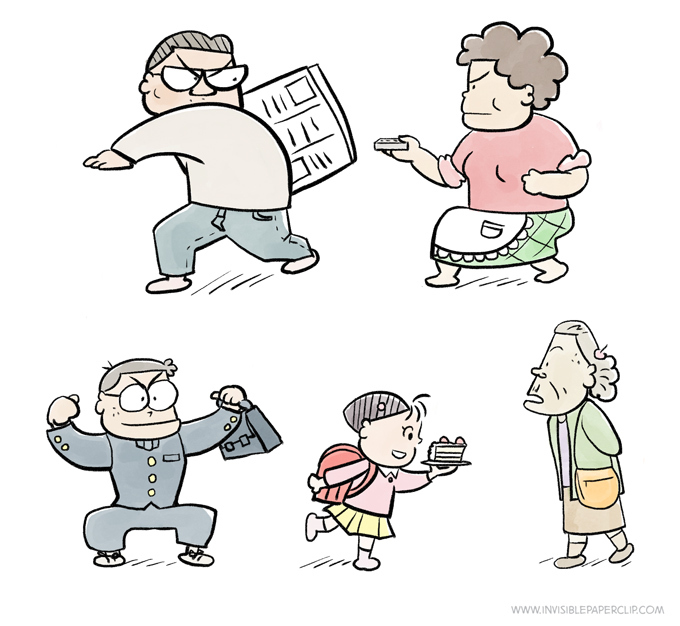 She studied illustration in university, while working on her cartooning in her spare time. An interesting fact was that comics were looked down upon, and not even taught, at her university at the time. My favorite part of the interview was when Oleksyk (sitting to the left in the photos above and below) explained how a storyboard artist works. She described in detail the process from initial outline of the plot, to how she collaborates with another storyboard artist on the sketches and the dialog (Regular Show episodes are always created by a pair of storyboarders working together). The final step is to make a finished polished version of the storyboard so that it is “legible” for the animators. 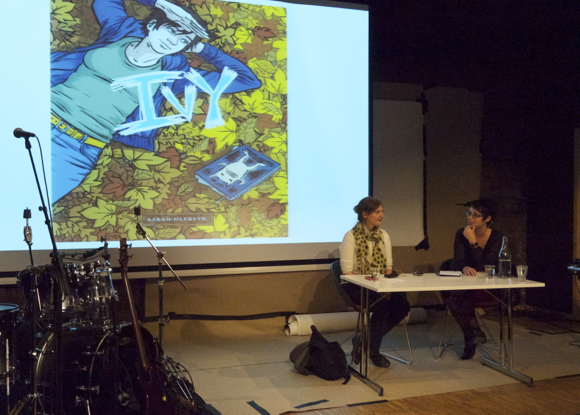 During her presentation, Oleksyk also showed the audience her workspace, and talked about her comic book named Ivy, minicomics, and the importance of warm-up sketches (tip of the day: doing warm-up sketches is very important!). After the interview, I stopped by Oleksyk’s signing table and bought a signed copy of Ivy. I awkwardly asked her if she could sign my Moleskine notebook that I’m hoping to fill with autographs by comic artists. To this day I’ve actually only had one sketch and signature in it (hey, you’ve gotta start somewhere). She was very nice and drew a character from Regular Show for me as well. 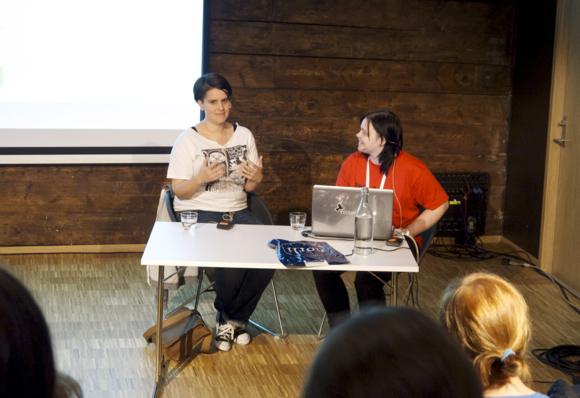 I also managed to catch a part of an interview with Lene Ask. She talked about her autobiographical comics, and presented a part of her new project based on old letters and photographs related to early Norwegian missionaries on Madagascar. 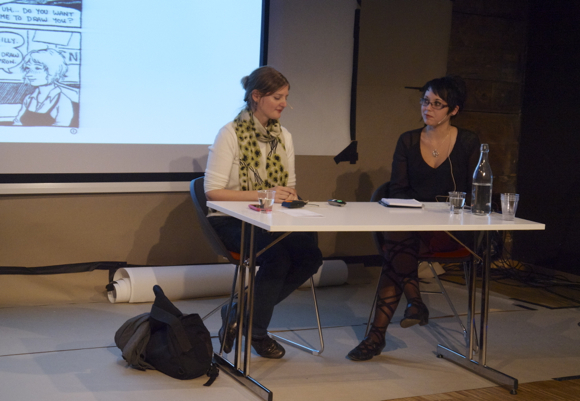 The event itself was very informal, and there were a lot of jokes exchanged between interviewee and interviewer (Ida Larmo, another Norwegian cartoonist and illustrator). The latter had recently become a mother, and was keeping an eye on her baby in her partner’s arms, who were also in the audience. At one point, the baby started crying. Out of necessity, Larmo had to breastfeed her baby when finishing the last questions of the interview. This all happened on stage, in a very classy manner in front of the audience. Hilarity and laughter ensued, in particular after Larmo had asked if anyone else were in need of some milk. It was a classic “you had to be there” moment, and I’m sorry for not having a better way to tell the story. One downside of today has been the feeling of constantly standing in someone’s way. The venue is very nice, but also very impractical. There’s a lot going on, and a lot of people milling about, especially in between the events and talks. And to get from one room to another, you have to go through crowded corridors and narrow doorways. Also, you can only fit about two or three people standing beside each other in the lanes in between booths, so it can get awkward if you want to stop and browse the items on sale. 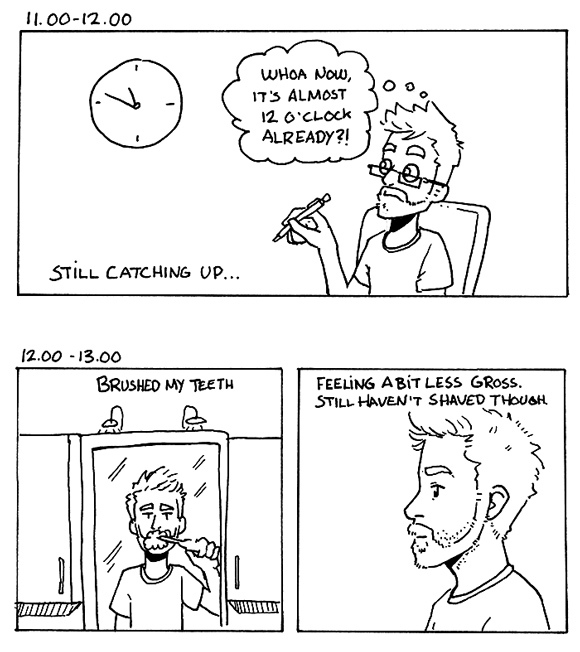 Apart from this, I have to say that today was an invigorating start of a great comics festival. 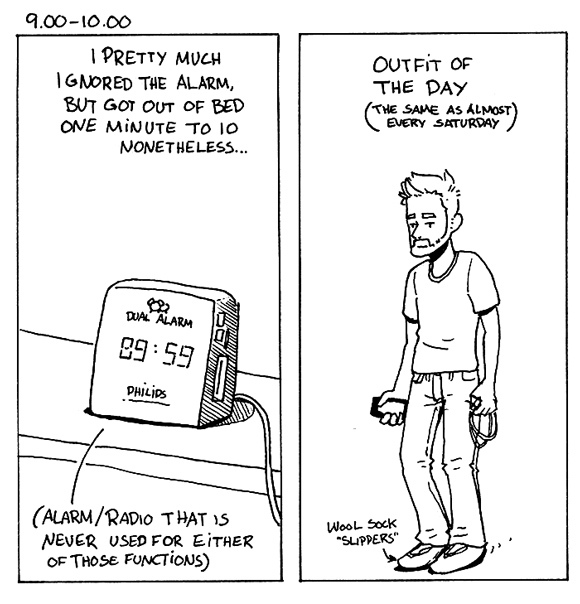 My guest comic, “Quest”, was posted on the Boumeries webcomic today! I’ll just post it here too, but you should check out Boum’s site as well. She’s got a growing archive of funny comics. Among other things, video games (perhaps Zelda and RPG’s in particular) and toilets are recurring themes, which is why I decided to combine the two to make this strip. 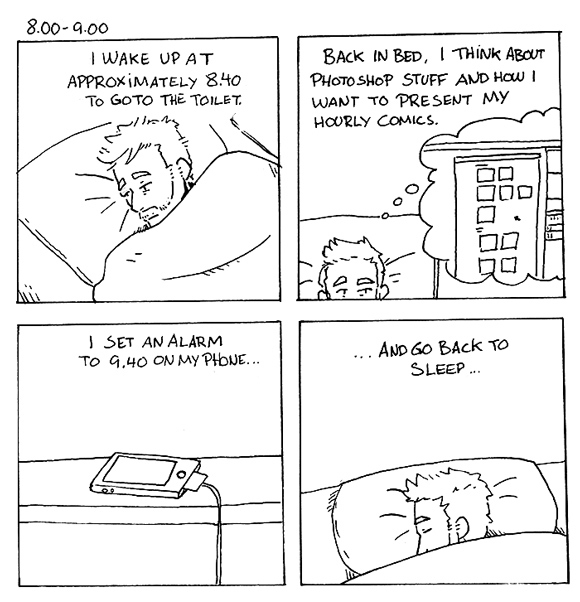 I posted a teaser of this strip on Instagram and mentioned it in this post.